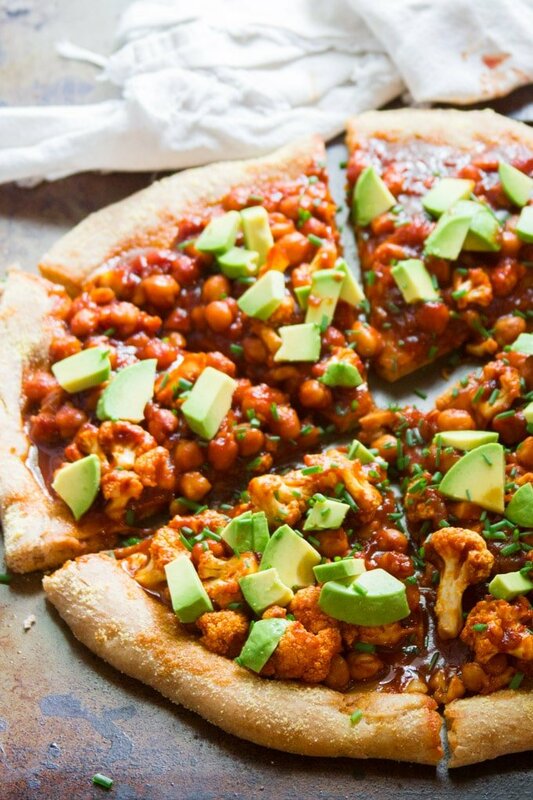 For this particular pizza, you’ll be roasting some cauliflower while the crust bakes. While all that happens, whip up a quick homemade vegan barbecue sauce. 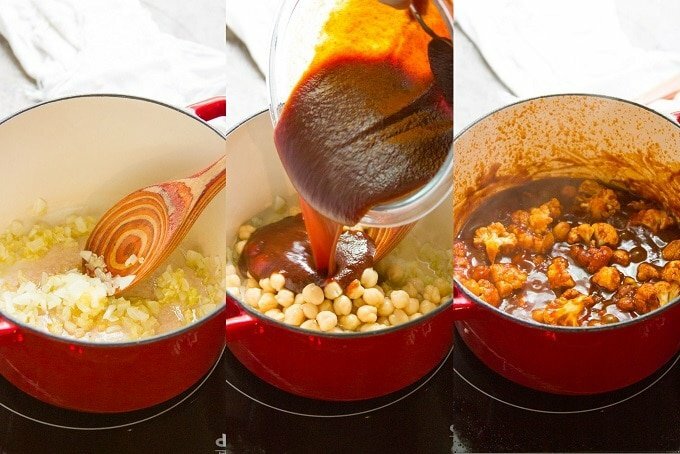 Simmer some chickpeas in the sauce, and when the cauliflower is done roasting, toss that in as well. 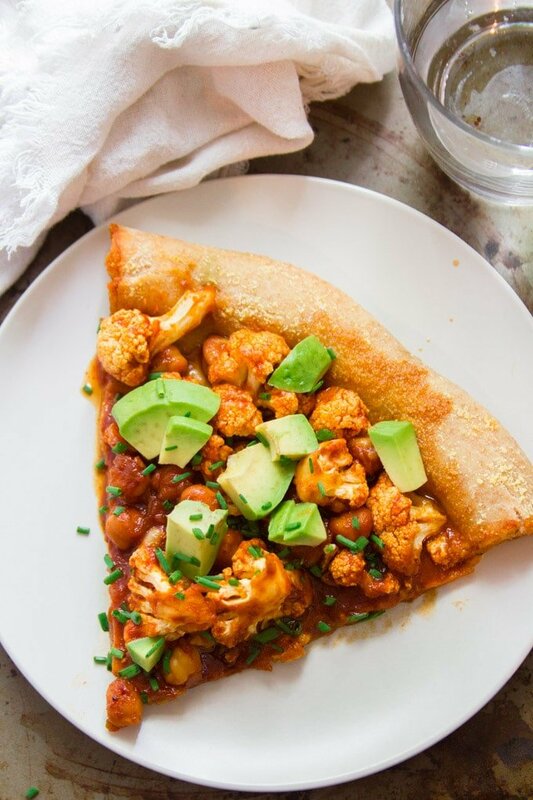 Once the sauce is thick and the cauliflower is tender, it’s ready for slathering all over your crust. Top with creamy avocado chunks and some chives, then devour. 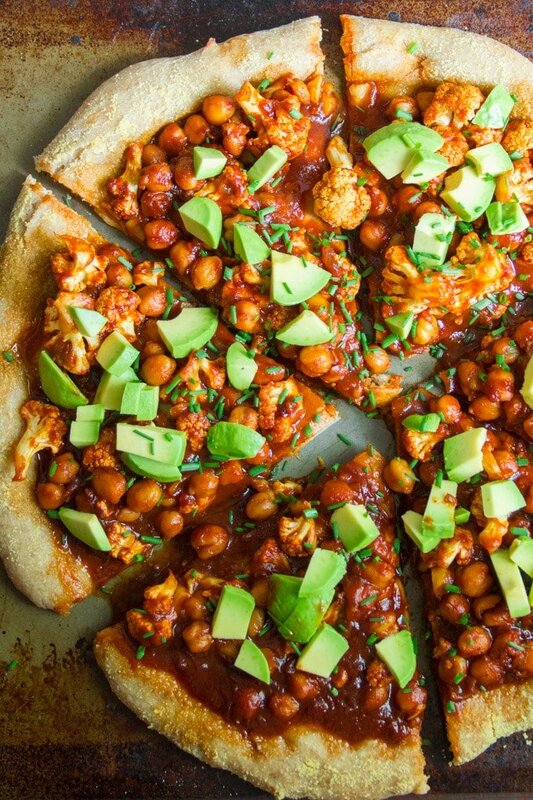 Feel free to substitute your favorite premade barbecue sauce. You’ll need about 1 1/2 cups. Wondering if the step of roasting the cauliflower is necessary? Well, it’s not, but it definitely improves the texture, and since you’re baking the crust anyway, why not? If you’re absolutely opposed to roasting the cauliflower, you can skip it. But add it to the pot at the same time as the chickpeas, so it has enough time to cook. Roll the dough into a 12 to 14 inch circle and place it on a lightly oiled or parchment lined baking sheet. Brush the top of the crust with 1 tablespoon of olive oil and optionally sprinkle with cornmeal. Place the crust into the oven and bake until fluffy and browned, 18-20 minutes. Place the cauliflower florets into a roasting pan or oven-safe skillet and toss it with 1 tablespoon of olive oil. Place the cauliflower into the oven with the crust and roast for 15 minutes, until it begins to brown. While the cauliflower roasts and the crust bakes, stir the ketchup, molasses, cider vinegar, soy sauce, liquid smoke, chili powder, smoked paprika, salt pepper and cayenne pepper together in a small bowl. Coat the bottom of a medium pot with olive oil and place it over medium heat. Add the onion and sauté until soft and translucent, about 5 minutes. Add the garlic and sauté one minute more, until very fragrant. Stir in the ketchup mixture and chickpeas. Raise the heat and bring the sauce to a boil. Lower heat and allow the mixture to simmer for 10 minutes. When the cauliflower comes of the oven, transfer it to the pot with the chickpeas. Stir it in and allow the mixture to simmer for about 5 minutes more, until the sauce is thick and the cauliflower is tender. 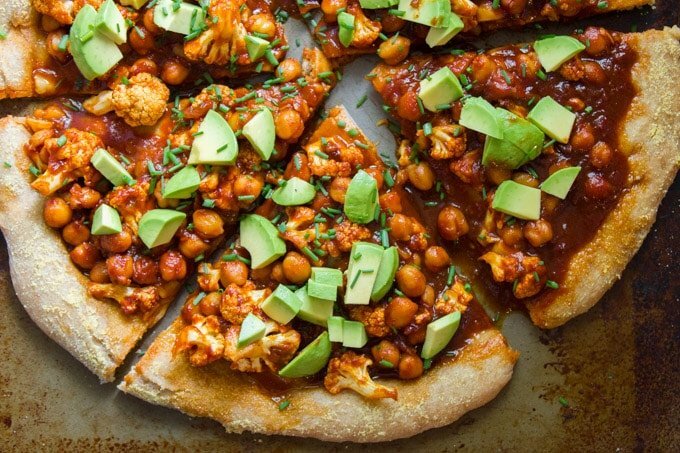 Spread the chickpea cauliflower mixture over the crust. Top with avocado and chives. I have a collection of bookmarked videos and recipes on sourdough, because I am thinking of taking that leap myself. I will probably order King Arthur brand starter to begin with. I figure since my homemade vegan yogurt attempts have so far not worked out as I wanted, why not move to something simple, like sourdough? Haha. Frustration awaits me! What are you using for starter? How is the bread-making going? Well, I’ve been failing for years at making vegan yogurt for years, and so far I’ve been pretty successful with the sourdough! I definitely recommend giving it a try. I actually made my starter from scratch, using spelt flour and the method if Artisan Sourdough Made Simple by Emilie Raffa (which has been a great resource so far). It took a good 10 days, but now it’s kicking pretty good and I’m putting starter into just about everything I bake. I used her method. Success. Here’s to a kitchen full of homemade sourdough and yogurt. Oh, thank you!! That looks promising! I might give the stove top method a try! Such a good pizza, will definitely make it again! I’m glad to hear it!! Thanks Yareli! Weird that nutritional info is provided but the crust isn’t specified … maybe assumption is that all pizza crusts have the same calories etc? I use Califlour crusts And suspect my count would be way better. Do you have any suggestions for substitute ingredients (even if I have to use a few) for the ketchup. I’d rather use something a little more natural as a base to the barbecue sauce if possible. Thank you! We had this for dinner last night and it is delicious!